Flitting above the counter, hovering atop some overripe fruit, is a cloud of fruit flies. They’re hard to see, measuring in at just 0.004 meters long—or 500 times smaller than the average human. Like their stature, their lives are short, usually only lasting about 21 days if given the right environment. I wish that my kitchen was not the right environment. Yet, I feel a special connection to these little invaders, because their powerful history is intertwined with ours. I start examining the fruit, looking for any sign of where they may be coming from. In truth, their journey started long ago. Researchers studying the DNA of fruit flies (drosophila is their technical name) suggest that they’re originally from somewhere in sub-saharan Africa, possibly Zambia1. Like my ancient ancestors, the early fruit flies wandered out of Africa and onto the Eurasian continent. The environment there was colder than their ancestral homeland, and the days were filled with different amounts of sunlight than they were accustomed to2. To survive as a species in these new lands, they had to adapt. Ancient humans faced similar circumstances. Current archeological research suggests that a distant ancestor of ours (Homo erectus) spread out of Africa more than a million years ago3. It’s thought that Homo erectus may have begun to adapt to the Eurasian climate and, over a long period of time, may have given rise to the Neanderthals and Denisovans. With short, stocky builds, the Neanderthals appear to have been well suited to northern climates. Genetic analysis shows that they had variations in pigmentation and circadian rhythms—likely adaptations that helped them cope with northern light exposure4,5. Want to learn about your Neanderthal past? Scientists have found that flies also evolve changes in their size, pigment, and circadian rhythms according to their environment2. The Neanderthals disappeared about 40,000 years ago, so they likely never knew about fruit flies (lucky them). Analysis of different fly populations suggests that drosophila first left Africa 15,000 years ago, well after the Neanderthals had gone1,7. It was even longer before they reached America—likely only a few hundred years ago—and probably only a few days ago that they made it here to my house. While they’ve been around for a while, it was only in the early 1900s that researchers really took notice of them. Their rapid development from egg to adult only takes about 10 days at room temperature (longer if it’s cold)6. This quick maturity, and the fact that it’s easy to make a lot of them—maybe too easy—means they could be useful a research model6,7. Scientists could easily study them, and when they did, it payed off. In 1900, genetics was only just picking up steam as a bona fide science. Most work at the time was being done in plants, but a few researchers saw value in drosophila as a model organism. At the time, there was a lively debate about whether genetic information was carried on chromosomes. Flies only have four pairs of chromosomes—considerably less than the 23 pairs in humans6,7. But flies also have easily identifiable traits like eye color and wing shape. By manipulating the flies’ chromosomes and observing the effect on their traits, Thomas Hunt Morgan and other researchers proved that chromosomes did cary genetic material8. The rest, as they say, was history. Since those days, drosophila has been a superstar in the genetics world. It turns out that, although the fly genome is much smaller than ours (only 180 million base pairs versus 3.2 billion in humans), we share many of the same genes7. Researchers found that many of the genes involved in embryonic fly development are also involved in human embryonic development. So although they’re small, flies develop in some similar ways to humans6,7. It doesn’t stop there, either. 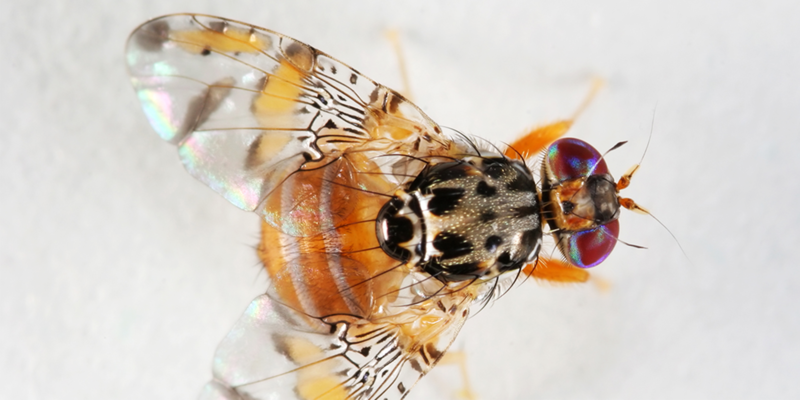 Much of what we know about memory, development, neurobiology, and circadian rhythms began as studies in fruit flies7. Looking at my reflection in the kitchen window, the contrasts are obvious: I have two eyes, a nose, and a mouth full of teeth. But we are similar—similar enough to learn from them about the molecular, genetic, and evolutionary forces that shape both of our lives. 1Pool, John E et al. “Population Genomics of sub-saharan Drosophila melanogaster: African diversity and non-African admixture” PLoS genetics vol. 8,12 (2012): e1003080. 3Carotenuto, F., et al. “Venturing out Safely: The Biogeography of Homo Erectus Dispersal out of Africa.” Journal of Human Evolution, vol. 95, 2016, pp. 1–12., doi:10.1016/j.jhevol.2016.02.005. 4Marciniak, Stephanie, and George H. Perry. “Harnessing ancient genomes to study the history of human adaptation.” Nature Reviews Genetics, vol. 18, no. 11, Nov. 2017, pp. 659–674., doi:10.1038/nrg.2017.65. Web. 15 Jan 2019. 5Dannemann, Michael, and Janet Kelso. “The Contribution of Neanderthals to Phenotypic Variation in Modern Humans.” The American Journal of Human Genetics, vol. 101, no. 4, 15 Jan. 2019, pp. 578–589., doi:10.1016/j.ajhg.2017.09.010. 6Gilbert, Scott F. “Early Drosophila Development.” Current Neurology and Neuroscience Reports., U.S. National Library of Medicine, 1 Jan. 1970, www.ncbi.nlm.nih.gov/books/NBK10081/. 7Hales, Karen G et al. “Genetics on the Fly: A Primer on the Drosophila Model System” Genetics vol. 201,3 (2015): 815-42. 8Carlson, Elof Axel. “How Fruit Flies Came to Launch the Chromosome Theory of Heredity.” Mutation Research/Reviews in Mutation Research, vol. 753, no. 1, 2013, pp. 1–6., doi:10.1016/j.mrrev.2013.03.001.